This story has been re-posted from CSUN Today. Read the story and see more photos in CSUN Today. The conditions of a country tell a story. In Blantyre, Malawi, they tell a hard story. In the African nation, extreme poverty leads to unsafe drinking water and inadequate medical care that’s far from adequate. With a scarcely resourced local police force, the nights are unsafe. Locals who can afford to live in a house in the city must barricade themselves inside their homes with chains and metal doors. These conditions would scare off a typical visitor, but for Janna Beling, they serve as motivation to improve the access to healthcare through physical therapy. Over the years, Beling has volunteered extensively overseas in countries such as Suriname, Vietnam and Malawi for a total of more than 100 days each, with the organization Health Volunteers Overseas (HVO). In the early 2000s, Beling began volunteering regularly with HVO, which is staffed by volunteer physical therapists, physicians, nurses and dentists who are committed to improving global health through education. Eventually, Beling became director of the organization’s physical therapy program at the Da Nang Orthopedic and Rehabilitation Hospital in Vietnam for HVO. In 2017, she became the director of the Physical Therapy Program at Da Nang University for HVO as well. Beling is also a professor and chair of the Department of Physical Therapy at California State University, Northridge. Beling, recently was awarded the Golden Apple Award for her contributions to the nonprofit organization Health Volunteers Overseas (HVO). The organization gives the Golden Apple Award annually to ​​a volunteer who demonstrates commitment to improving global health and making a positive impact at HVO project sites across the globe. For more than 17 years, Beling has been connected to HVO. Every year, she takes CSUN doctoral physical therapy (DPT) students abroad to volunteer as part of their senior capstone for the “physical Therapy in an International Setting” elective. 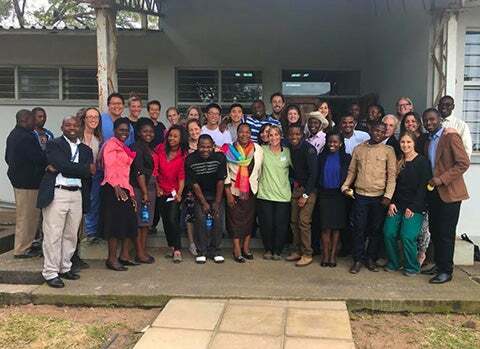 Beling’s goal has been to improve the health welfare of communities in African and Southeast Asian countries and to help make the rehabilitation programs sustainable and self-sufficient. In Malawi, life expectancy is less than 60 years. Beling’s dream has been to improve this directly through better access to health services, she said. But there are also cultural challenges, she noted.